When I left Paris in the summer of 2006, I promised myself that I would go back at least once a year. And, so far, I have. Even though it doesn’t have London’s fast-paced and ever-changing atmosphere, there is always something exciting going on in the French capital and a good enough reason to go back. When I’m there I like to take the metro, go to the opposite side of town from where I am staying and slowly walk my way back, stopping by a new art space, a new boutique in the Marais or – who am I kidding? – a new boulangerie to indulge in a beautifully light yet butter-filled pastry. The last time I was there, however, I barely left my hotel. Perhaps more surprisingly, I didn’t feel that I was missing anything. 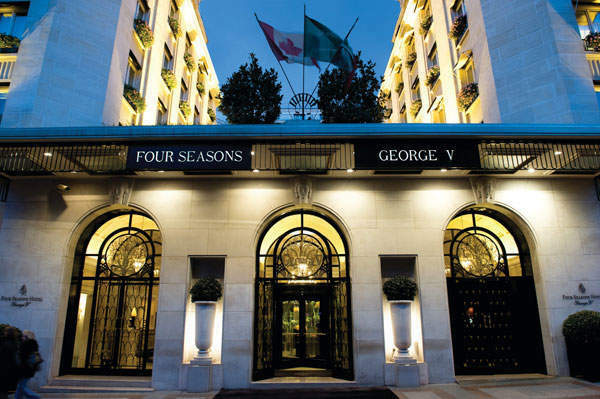 Of course, the fact that I was staying at the Four Seasons Hotel George V helped a lot. 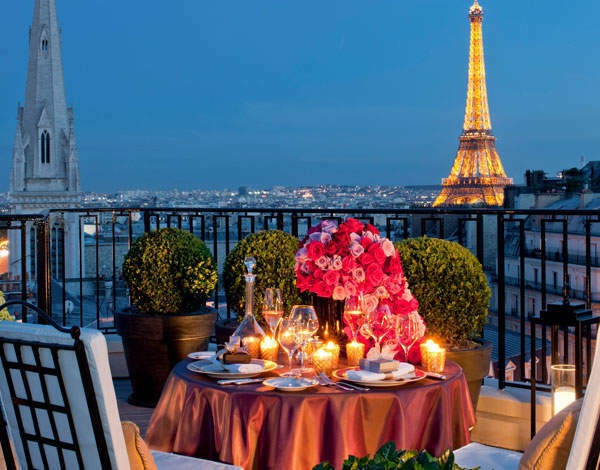 The elegant eight-storey hotel consistently ranks among the best in the world and it was granted ‘palace’ status from the French Agency for Tourism Development in 2011, meaning it ranks above five stars. Located off the Champs-Elysees, the George V was built in 1928 and converted to a Four Seasons in 1999 following a two-year renovation. Its Art Deco architecture gracefully mixes with its old European interiors (French furniture, Flemish tapestries, Italian crystal chandeliers). 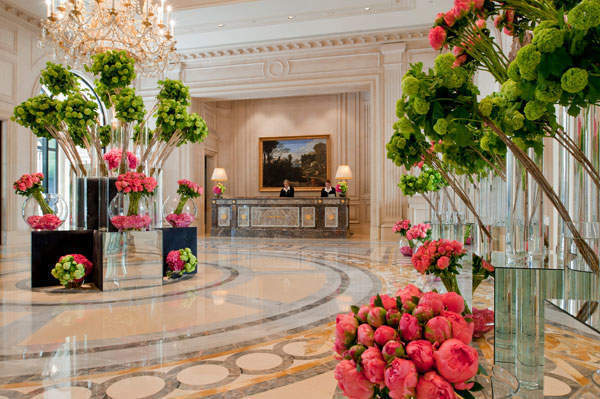 Add its modern flower arrangements – which are now famous on their own, thanks to the talent of California-born Jeff Leatham – and you understand why the hotel manages to have a charming and exclusive feel without ever being stuffy. It is not the kind of hotel where you end up never sitting on the antique chair for fear of ruining it – instead, the first thing you want to do when you enter your room is jump on the king-size bed and fall asleep in starfish position. 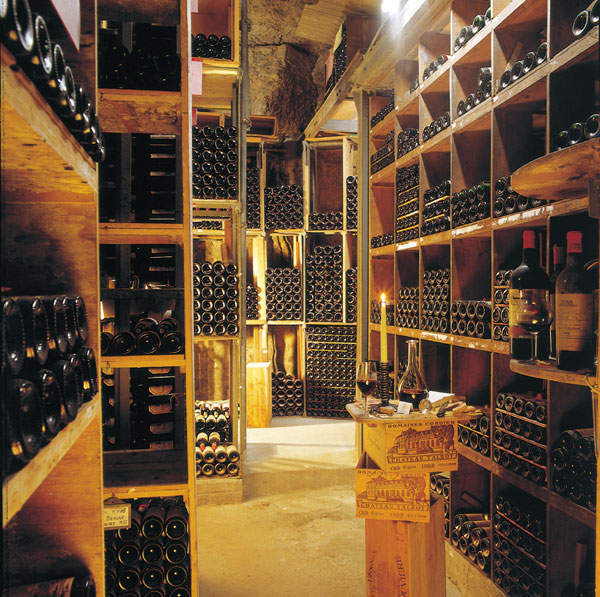 After a quick visit to the wine cave (pictured below) – whose highlights were a bottle of 1795 Madeira, made two years after Marie Antoinette was beheaded, and the collection of all the bottles of Petrus that have been drunk at the hotel, with prices reaching €45,000 a magnum – it was time to leave the George V.
Direction: Asnières-sur-Seine, a small town to the north of Paris, where we visited Louis Vuitton’s family home. The house, a two-floor building with a wide garden and stained-glass Art Nouveau windows, is now the atelier where the maison’s famous trunks, some of its handbags and other specially commissioned works are handmade – if you want to gift your children with a Louis Vuitton doll house, for example, or would like a box for your poker cards and chips, this is where they would be manufactured. Visiting the atelier is a fascinating experience, as you walk around whole crocodile skins and heavy rolls of leather with the famous LV monogram, but also nails, glue, locks. Goods at different stages of their production are scattered around the large open space, together with pictures of the workers’ families. It’s far away from the mass-production and impersonal business I expected Louis Vuitton to have become since Bernard Arnault started collecting luxury companies with the same voracity his clients collect purses. Instead, there is humility in the way the products are done and the appreciation that the production of high-quality goods can’t be moved around the world looking for lower wages and less social security. Back at the hotel for a back-of-the-hotel tour, I saw what a logistical nightmare it must be to make the hotel run smoothly at every hour of every day. Because managing the George V is like being the mayor of a small town. To begin with, the hotel employs 700 people, including a huge technical team of carpenters, electricians and marble specialists, and its 244 rooms and suites can accommodate about 500 guests. That’s just the permanent population. 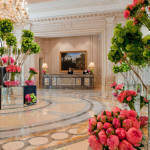 But the Four Season also has several ‘tourists’ every day – people who come in for a few hours to enjoy the spa, attend a business meeting at the café La Galerie, or enjoy the food of the two-Michelin-star restaurant Le Cinq, headed by chef Eric Briffard. On this tour, I also saw the (seemingly unglamorous) luggage-storage room, which has its own intriguing inhabitants. There’s a piano, for example, that has been here since 2004, waiting for its owner – the popstar-wannabe daughter of a famous celebrity – to come back to reclaim it. An Arab prince left several Louis Vuitton bags in October last year, while another guest likes to keep a ceramic crocodile so that the hotel can use it to decorate his room every time he is in Paris. Sometimes, space can be tight, like the time a Saudi Arabian prince showed up with more than 900 suitcases. This is the kind of unique experiences the Georges V can offer to its clients, even though the Louis Vuitton visit was organised exclusively for us. 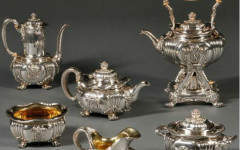 But the hotel uses its extraordinary cast to offer different activities, whether that’s weekly visits to the local food market with chef Briffard or floral arrangement classes with Leatham (if you think mixing up red roses and baby’s breath looks good, think again). The wider Four Seasons group also organises private jet tours – bringing clients around the world or across Europe on board a special 52-seat Boeing 757. ‘We open doors that are normally closed,’ says Jean Pierre Soutric, Four Seasons’ vice-president of corporate and travel industry sales for Europe. Perhaps that’s why I didn’t mind spending most of my time inside.